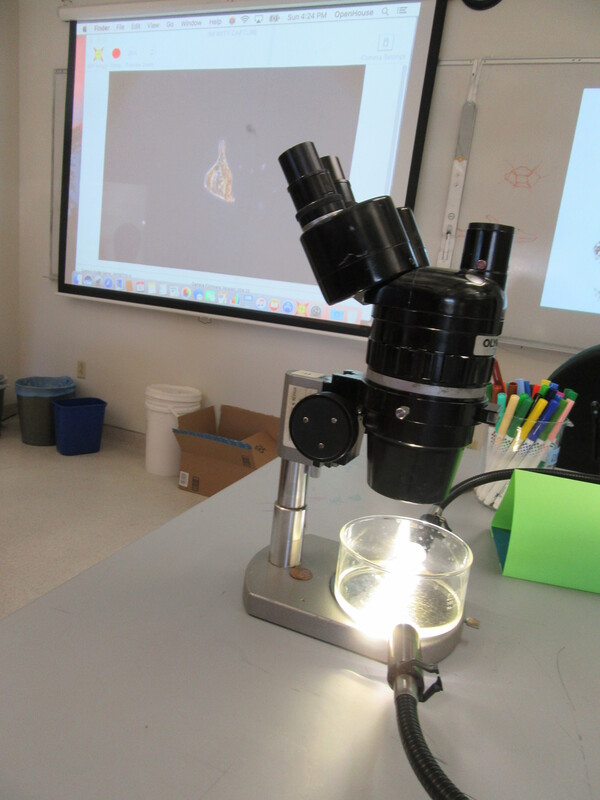 At this year’s MLML open housee we set up some microscopes in the biological oceanography lab so that visitors could explore and discover plankton. 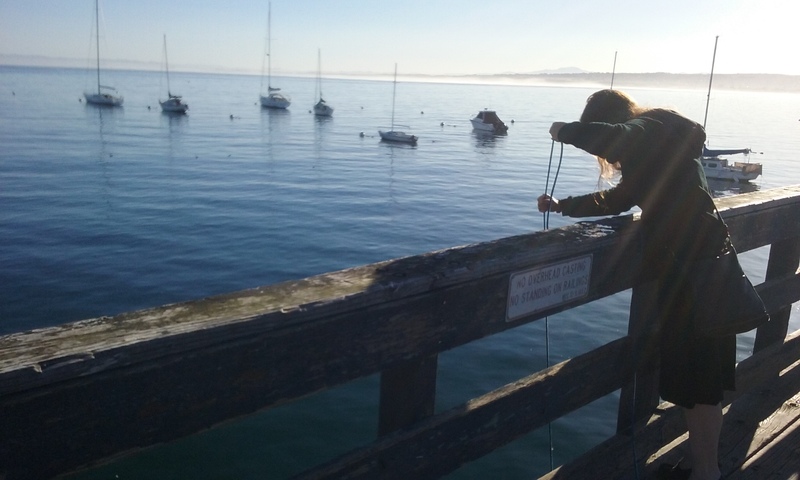 In the morning before the open house I stopped at the wharf in Monterey to collect a phytoplankton net tow. It was a beautiful morning, and an otter with her pup swam by to check out what I was doing. Back at MLML we put the sample under a dissecting microscope and also projected live images on the wall at higher magnification from compound microscope. Most of the visitors had never seen plankton before, though many had heard of them. The comment I heard most often from the visitors was that they had no idea how small plankton were: most people expected them to be larger. Many scientists draw what they see while looking through the microscope. Drawing forces you to identify every detail of the cell, and helps you become better at identifying species-defining features. Plankton are also very beautiful, and inspire scientists to create art. I was inspired to share an art activity created by the scientific illustrator/artist Kirsten Carlson during a recent research cruise. Kirsten was the Schmidt Ocean Institute’s artist-at-sea during the R/V Falkor “Sea to Space” research cruise this past February (and a former MLML graduate student). She encouraged all the scientists draw plankton images on coasters while we were out at sea. 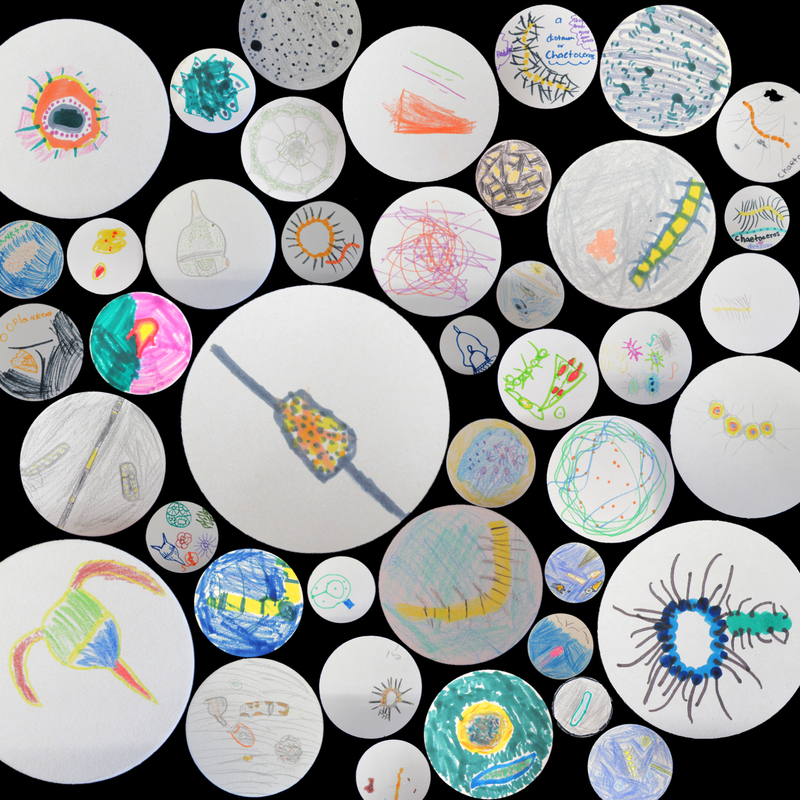 For the open house I encouraged people (mostly kids) to illustrate what they were seeing under the microscope. People were very excited to attempt to translate what they were seeing onto paper. I was so fascinated by the particular details that stood out to different people. So people were focused on the way the light refracted off of the cell and affected the colors. Others focused primarily on shape. Some people were more interested in the big-picture view of how all the plankton looked mixed up together in the jar. Sharing how different people look at the same thing helps everyone discovery something new. This year we estimate ~2800 visited MLML for the open house. 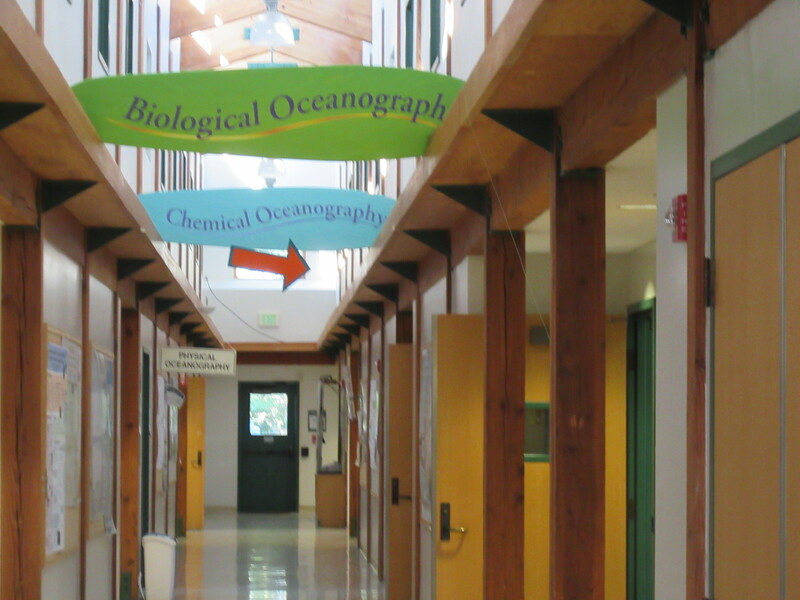 Here is a sample of what people saw under the microscope in the biological oceanography lab.